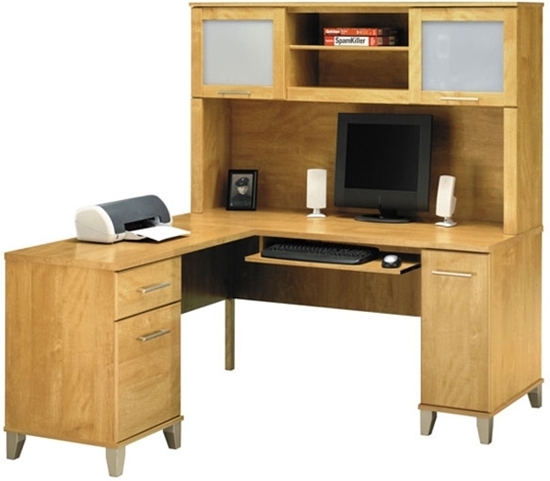 Presented in a rich Maple Cross finish, the transitional L shaped desk with hutch by Bush provides two full drawers and ample storage. It is an ideal solution for your home office or business. Perfect for a desktop workstation, laptop computer or tablet. Free shipping and warranty on all orders. Open compartments for books or binders. Frosted glass doors attractively conceal left and right storage areas. Hutch can mount on left or right side of L shaped desk. Available in a rich Maple Cross finish with tapered metallic leg accents, the transitional Somerset Collection bookcase by Bush provides an ideal solution for both home office furniture or at the office. Order today and get free shipping!